It is copyright © Jeffrey Side and Jacket magazine 2010. See our [»»] Copyright notice. has had its venom emasculated. I am caught in your days. so it was mentioned to me. got to give it to you. Jeffrey Side has had poetry published in various magazines such as Poetry Salzburg Review, and on poetry web sites such as Underground Window, A Little Poetry, Poethia, Nthposition, Eratio, Pirene’s Fountain, Ancient Heart, Blazevox, Lily, Big Bridge, Jacket, Textimagepoem, Apochryphaltext, 9th St. Laboratories, P.F.S. Post, Great Works, Hutt, Poets’ Corner, The Dande Review, Poetry Bay and Dusie. He has reviewed poetry for Jacket, Eyewear, The Colorado Review, New Hope International, Stride magazine, Acumen, and Shearsman magazine. 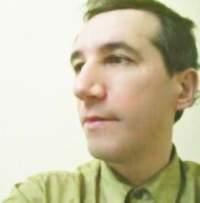 From 1996 to 2000 he was the assistant editor of The Argotist magazine. He has three poetry books available, Carrier of the Seed (Blazevox), Slimvol (cPress) and (with Jake Berry) Cyclones in High Northern Latitudes (Lavender Ink).